thus bored with your… A-Side? So explore your other side, your B-SIDE!!! Live the freedom of adventures to limitless horizons!!! 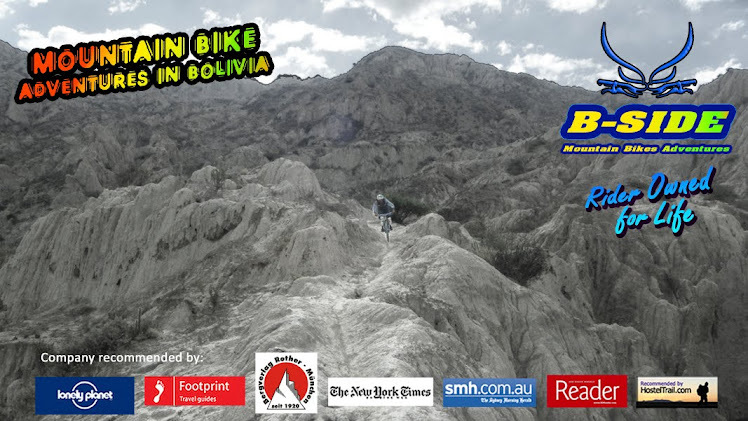 Welcome to the Mountain Bike wonderland in the heart of the Andes… BOLIVIA!!! In the Bolivian Andean zone you can ride from 17,000 feet elevations down to warm lowlands as you challenge dreamlike chutes and mountain faces, flow trough mystic trails and ancient small country towns built by pre-Columbian civilizations whose culture is alive today. 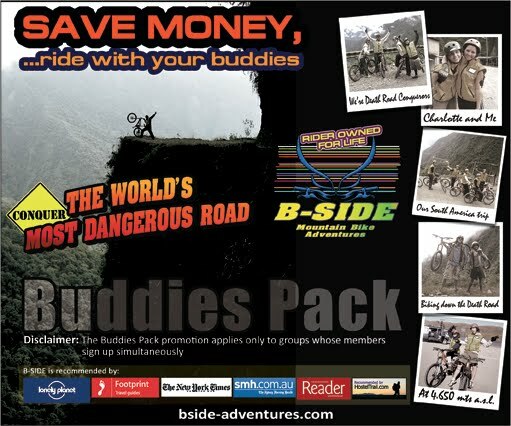 Free your mind and soul riding with B-SIDE MTB Adventures® in some of the most mysterious, isolated and unpopulated hill regions of the world! It’s time to live your B-SIDE, your BIKE SIDE! Come and conquer our never ending rides! They are adventures to limitless horizons! Who cares about mud and bruises? You’ll be overflowing freely with pure riding satisfaction! … Parachute not included :D !!! B-side slideshow.... GET IN THE PICTURE!!! The full B-side team includes freeriders and racers who joined Downhill, 4X, BMX and Cross Country races. For more adventures contat us. AND DON'T FORGET IT...YOU GET WHAT YOU PAY FOR! "We rode on the World's Most Dangerous Road and conquered it"
You got new friends. You develop budding friendships. You feel open to new people, to the freedom of loosening up. Dare to say "We did it! We conquered the World's Most Dangerous Road! 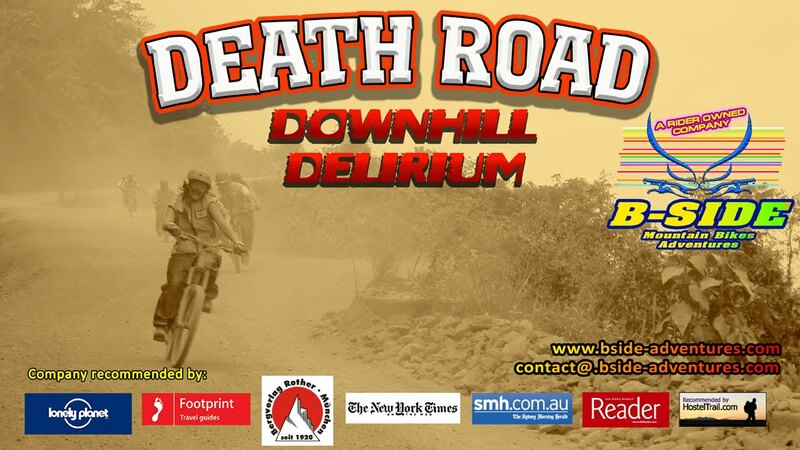 Mountain Biking on the Death Road or The World's Most Dangerous Road is a world adventure highlight that you buds, should not dare to miss. A huge drop around 3.500 mts from the highest point to your final destination is waiting for you, adventurers. Did you believe it was impossible to see snowy mountains and then a green jungle in just 5 hours? Would you stand over the edge of the 400 meters cliffs and get a look down? Get amazed. Remember the group experiences and friendship burned at your CD photos and videos. Conquer, do not just survive this once in a lifetime experience. Ride with a recommended professional company offering just full suspension bicycles and the lowest ratio guide to client around. Because your personal safety is first! Mountain Biking on the Bolivian road deservedly denominated as "The Death Road" or "The World’s Most Dangerous Road" is one of the world adventure highlights you should not miss. A huge drop above 3.500 mts from the highest point to the final destination is waiting for the adventurer. Did you believe it was impossible to see first snowy mountains and lastly the green jungle in just 5 hours? Would you stand over the edge of the 400 meter cliffs to get a look at the forest below? Ride under the waterfalls dropping on the road. Get amazed. Conquer not just survive this once in a lifetime experience riding with a very recommended professional company offering you just full suspension bicycles and the lowest ratio guide to client around. Because your personal safety is first. Ecoregions gone through: Highland Puna habitat, montane cloud forest, evergreen cloud forest, tropical and subtropical moist broadleaf and other types of ever green forest. Ability Guide: Level 1, suitable for every level of rider (Possible for confident beginners) average fitness and above. Safety, emergency and rescue facilities. PLEASE MAKE SURE YOU BRING 25 Bs. on your World s Most Dangerous Road ride. This money will be collected by an Sub-Central 2 de Febrero representative at Unduavi village and you will receive a nice legal receipt in exchange. In one day ride, more than 3.800 mts of vertical descent on the World's Most Dangerous Road. Traditionally, the ride down to the World’s Most Dangerous Road splits into 2 parts: One section on paved road and the final and challenging section on a narrow 4*4 road. The name of this ride derives from this second part denomination. The fast first part is worthy to ride on but many would like to enjoy instead a ride on the old road to Coroico before entering to the exciting second part. Just think on changing paved to dirt 4*4 road, riding on a car-free road and looking at some of the awesomest and undiscovered Bolivian landscapes. Then, enter to the WMDR and conquer their blind corners and twisted narrow sections. Feel how a waterfall drops on you. Breathe clean air. Ride amidst butterflies and tropical flowers. 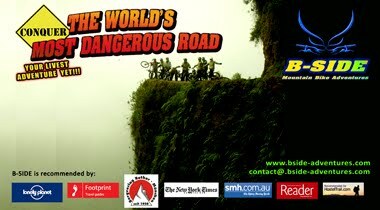 There is just one World’s Most Dangerous Road and it is worthy trying it! Ability Guide: Level 2, suitable for intermediate riders average fitness and above. Yes, you are steady, sturdy and lusty and know the celeb Death Road is risky and tricky but worthy of riding. Your buddies and the traveler guide informed you this month is rainy, muddy and misty and you cheer the idea of challenging harsh weather conditions on a hardy mountain bike and yell... I conquered the Rainy Death Road!. Well maybe there in no choice but to try now and them exclaim I did it! anyway. So, you worry on the gray cloudy sky and expect more then signing up and keeping fingers crossed. Smart decision. First, because your hands must firmily hold the bike grips and second, 'cause there may be more then simple chance involved in ends. Call it managing risks, organizing a bike tour or summarizing, a professional company with the best safety background, working out it for you, bringing experienced guides to smaller groups, tough bikes with superb components and the compromise the we will work hard to bring you as much safety as possible. We can not promise a happy end but to deliver professionalism, implment safe practices on the road and focus on your way ahead! An Epic Ride... for sure!!! Congratulations to B-Side crew on taking the first places at the past Downhill Competition on the Devil's Tooth. B-Side is a company 100% focused on Mountain Bike Adventures; pure and simple! a rider owned company founded and managed by passionate freeriders who have been exploring and riding in Bolivia for many years also have compited in downhill and 4*4 races. All of the B-Side people are riders aimed to bring a superb service to our clients. Our Company Mission Statement is to provide the safest, the most professional, the funniest and the highest quality service in a guided mountain bike tour. Since it started to operate in 2006, B-Side served safely thousands of clients from Europe, Australia, Canada and USA mainly. Our former clients enthusiastically recommended our travel services by word of mouth referrals or wrote about in online travel web sites. Our company created the Andean Freeride concept, which is about self expression and riding skills at whatever level to maximize the enjoyment of biking freely in a mystical and pure natural environment. It is meeting the magic of Bolivia, one of the 1-5 most bio-diverse countries in the world while freeriding! San Diego Weekly Reader "DEATH ROAD"
Bajando hasta Coroico... ¡En bici! Funds for south america trip? Global Travel Help (Funds for south america trip? World Nomads "Death Road mountain bike trip to Coroica"